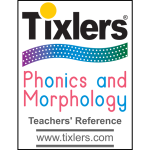 The Phonics and Morphology Teachers’ Resource show you the Phonics and Morphology Decks’ content is a convenient form for lesson planning. Each page has the contents of nine cards. In addition, there is a table at the contents that makes finding the concepts’ cards easy, and recording sheets at the back for you to copy to record assessment and lesson status of each concept for each student. 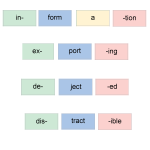 The Morphology Magnets, comprising 352 prefixes, suffixes, Latin and Greek roots, and connectors. Take out a few for each lesson to show your student the structure of a huge proportion of English words, to have them construct words given a desired meaning, and to understand unfamiliar words based on the roots, prefixes, and suffixes — and watch their progress! 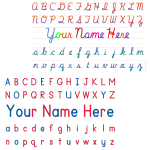 The Classroom Alphabet Strip has the beautiful Tixlers® Letters – the same as our cards – in laminated strips 17″ wide and 5.5″ high. When put together, they form a 13.5′ strip for a classroom wall. 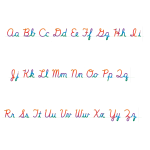 The Customized Placemats have a name you choose, the upper case alphabet, and the lower case alphabet on each side – one cursive, the other manuscript. They are laminated for easy clean-up. Please shop our product page.